Purple Reign: The Prince Tribute Show Las Vegas is one of the most unique tribute shows playing in Sin City. Jason Tenner is the mastermind behind this tribute event that follows the storyline of the original movie Purple Rain. This 75-minute show will take guests on a ride in a time machine that exemplifies the wonderful musicianship and creative of the famed rock star Prince. For more than ten years this tribute show has graced the stages in Las Vegas and continues to please fans of Prince as well as the general public. Purple Reign: The Prince Tribute Show opens with a bang with Tenner spot on in his appearance of Prince. He continues with the storyline while performing perfect renditions of Prince’s hit singles. The electricity created during Let’s Go Crazy is amazing as well as the sultry sound of When Doves Cry that has the crowd swaying. When Tenner breaks into 1999 the stage has high voltage energy everywhere. The mood of the music brings many people in the audience to their feet or just grooving in their seat. The crowd is appreciative of the time that Tenner and his group have spent in making sure their roles are realistic in appearance as well as sound. 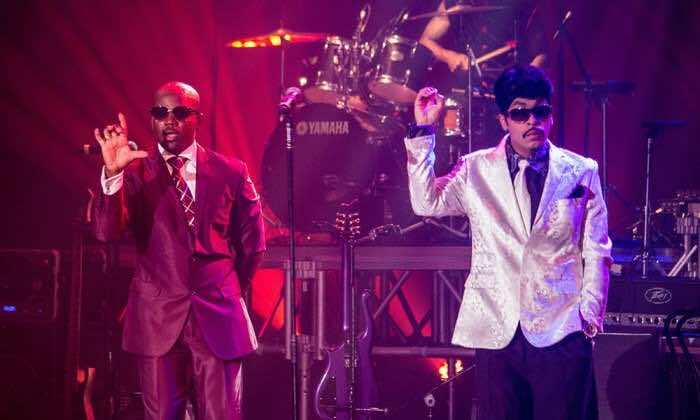 The production of the show moves quickly to embrace the other sidelines in the movie such as Morris Day and Time as well as Jerome performing memorable hits from the soundtrack that include The Bird and Jungle Love. LaMont Marcus is a perfect Morris Day during the event that will leave guests smiling. Purple Reign: The Prince Tribute Show includes plenty of showgirls who are a staple of any Las Vegas routine. The beautiful costumed dancers are graceful during many songs as they follow the beat of the music. While performing the upbeat tune Raspberry Beret, Tenner is joined on stage by a showgirl who is literally just wearing a raspberry colored beret. The show does not stop there and Tenner belts out a splendid version of Little Red Corvette before ending with the movie's signature song Purple Rain. The choreography of the show is spectacular with Tenner changing costumes three times during the event. The wardrobe is unique and matches that of the 1984 movie. The pure cost of the wardrobe is amazing with some of his suits costing $1,100 and the long coats around $700 each. There are plenty of glitzy stage props during Purple Reign which fits perfectly in the European cabaret feel of the venue. The state-of-the-art sound system coupled with fantastic lighting adds an additional dimension to the experience. In the end, Tenner is perfect in his impersonation of Prince and the musical prowess that he displays during the event is just as equal. For people that love Prince and those people that might be on the fence, Purple Reign: The Prince Tribute Show is another example of a quality tribute event in Las Vegas that is full of good entertainment. 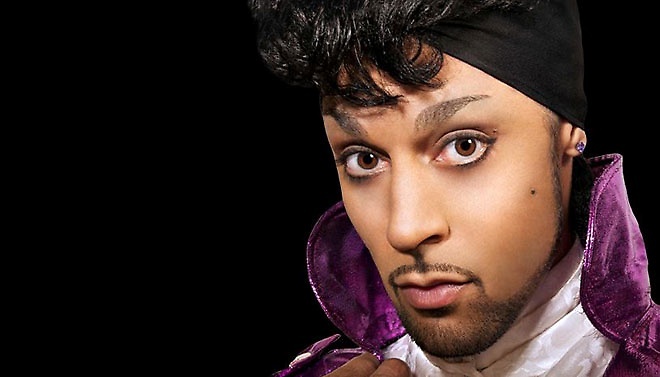 The Purple Reign: The Prince Tribute Show highlights the talents of many musicians, dancers and singers but none of them stand out like Jason Tenner who impersonates Prince. Jason is the perfect Prince match from appearance to voice to dance moves. Jason Tenner was at a crossroad in his life in 1996 when he found himself dressing up as the artist Prince for Halloween. This life changing event left Jason pursuing a career portraying Prince on stage as a tribute artist. Jason studied video clips from Prince’s concerts, television appearances and the movie Purple Rain in order to finalize many of his identical dance steps as well as gestures performed during his tribute show. Over the years Tenner has become friends with many of the original Morris Day band members including Jellybean Johnson and Monty who have helped him hone his Prince skills. Purple Reign: The Prince Tribute Show Las Vegas is performed at Tropicana Theater located within Tropicana Las Vegas - A Doubletree by Hilton. 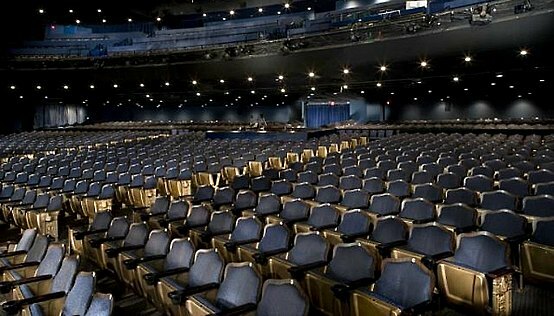 The intimate setting is perfect for this type of high energy show with great sight views from any seat. The décor is European cabaret with fabulous color tones. Guests must be 18 years of age or older. Purple Reign performs Wednesday through Saturday nights at 9:00 P.M. Purple Reign Tickets are on sale now. VIP experience is the extraordinary Purple Velvet Package which includes pre-seating in the VIP area, Purple Reign merchandise and an autographed photo (Fees and Taxes not included).